ruthdelacruz | Travel and Lifestyle Blog : SM San Lazaro 3-day Sale and My To-Buy List! SM San Lazaro 3-day Sale and My To-Buy List! SM City San Lazaro will hold a 3-day sale on April 15, 16 and 17. I already got a list on my mind on what to buy. Although, I have to be a little more careful in using my credit card.. I am saving my limit for my trip in Hong Kong this May. I always bring a week-end bag whenever I travel. My friends and family know me that I am no light traveler. An overnight trip would mean 3 sets of clothes for me (just being safe if ever we get stranded). So a multiply 3 with the number of days I would be staying in a place, that should equal to the number of clothes/shirts/dresses that I will pack. Add the accessories, watches and shoes, and bags that should go with it! Well actually, for bags, I only bring my Victoria Secret sling bag when traveling and exploring the place. Something which is close to my body to keep my money, celphone and passport (and kikay kit). I am thinking if I should buy a Samsonite luggage , but I think it is a little too expensive. I need to consider the baggage limit too. But just the same I would need to buy a luggage. This is actually an extra storage for my shopping spree! I looove this set; however, I know it would cost me thousands to buy that. So I'll just scout for the most affordable and durable piece this weekend. For my camera . I don't have a spare, and being the camera whore that I am, I would need an extra battery pack. The worst thing that ever happened to me during travel was when my camera died during our trip in Singapore. Just when we have landed to the land of Merlion, it just died! Which prompted me to buy this Sony Digicam (at a cheaper price with lots of freebies !). 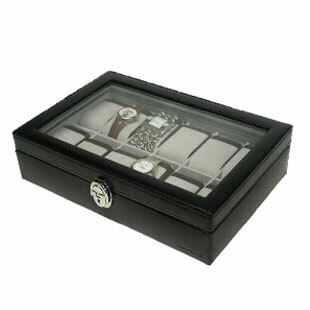 I saw new stocks of the watch case I was eyeing last December, and I have to get it. My friend already gave me one but it can only hold 4 watches. The case I saw can hold 10 pieces. Enough storage to store my collection. This one looks exactly the same case I saw in the department store.. and I have to have it! I was invited to 4 events this month. Two kids' parties (one year-olders), a wedding and a christening. I am googling for best gifts to give, though I would only attend 2 from these events. Which reminds me, I would need to sport a hippie look for one birthday party (which got me thinking, I need to buy a new dress!). © ruthdelacruz | Travel and Lifestyle Blog : SM San Lazaro 3-day Sale and My To-Buy List!